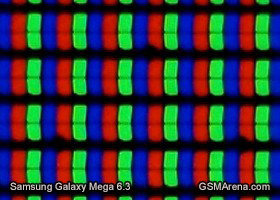 Display stretches 720p resolution on 6.3"
At the core of the Samsung Galaxy Mega .63 is the 6.3" screen. It's a massive TFT LCD of 720p resolution, which works out to 233ppi. While that's nowhere near the 441ppi of the Galaxy S4 or even the 306ppi of the S III, it's better than what the Galaxy Grand got and the same pixel density as the Galaxy S III mini. You have to take into account that bigger screens are usually held further from the eyes, which partially makes up for the lower pixel density. If you're coming from a Galaxy S4 you'll immediately spot the lower sharpness, especially when looking at text, but other than that the screen image quality is good. With all this talk of pixel density, we have to mention the resolution and how it affects the interface. While the screen of the Mega 6.3 is much bigger than that of the Galaxy S4, it doesn't fit more shortcuts or other UI elements. Samsung could have drawn the elements smaller, but that would have affected the image quality as smaller text doesn't render as well on the relatively low pixel density (compared to the previous and current generation of flagships). The Mega 6.3 screen has good viewing angles with no color shift and only slight contrast loss when looking at the display at an a angle. The brightness control in the notification area is quite handy and can be hidden to make room for more notifications. It also features an automatic brightness mode with a slider to tweak the algorithm, making the display generally darker or generally brighter. The Samsung Galaxy Mega 6.3 features a standard set of sensors on its front (proximity and ambient light), a 1.9MP camera and a status LED, all clustered around the earpiece. On the other side of the screen is the traditional arrangement of a hardware Home button and capacitive Menu and Back keys. 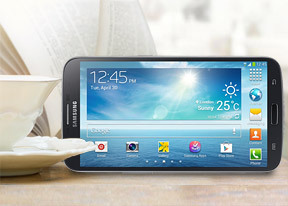 Stock Android has moved away from this arrangement, but Samsung insist on it. There's extra functionality too: upon a double tap, the Home key launches S Voice, while a press and hold opens the task switcher. A long press of the Menu key launches Google Now, and a long press of the Back key toggles the Multi-window tray (the Multi-window feature needs to be active for this to work). The Volume rocker is placed on the left side of the Galaxy Mega 6.3, while the Power/Lock key is on the right. Both are positioned proportionally lower on the tall device, so they are at about the same height from the bottom as the ones on the Galaxy S4. There's no dedicated camera shutter key, but the volume rocker can be set to act as a zoom lever, still or video camera shutter key. The bottom of the Galaxy Mega 6.3 features a microUSB port with MHL functionality, so you can output HD video with the appropriate dongle. The mic pinhole is next to the USB port. At the top of the device is the secondary mic (for noise cancellation and stereo audio capture), a standard 3.5mm audio jack and an IR emitter. The emitter is used for the remote control functionality, which is great but it makes a bad impression that it's just a hole on the top of the device. Around the back of the device there's the 8MP camera lens, centrally placed at the top. It protrudes from the 8mm thick body and the device rests on it when placed on its back, which makes it unstable and means you should be careful not to put it on a surface that can scratch the lens glass. Below the camera is the LED flash and at the bottom of the back is the loudspeaker grille. The back cover is made of the hyperglazed plastic that Samsung favors in recent years and can be opened. Below it is the 3,200mAh battery, which can be removed too. We expected a bit more capacity from the battery, it's barely bigger than that of the Galaxy Note II (3,100mAh), despite the Mega 6.3 being bigger (the screen especially). The NFC module is in the battery itself. Right next to the battery is the combined microSIM / microSD card slot. The cards are stacked, the microSIM at the bottom and the microSD on top. The battery blocks the way, so you have to pull it out to change one of the cards. In fact, you'll probably have to remove the microSD card to swap the SIM card too, as it's hard to reach when the top slot is occupied.